In 2012 Nathan Amador Rowley traveled to Kangerlussuaq, Greenland as a field assistant to assess vegetation health under various climate warming scenarios. 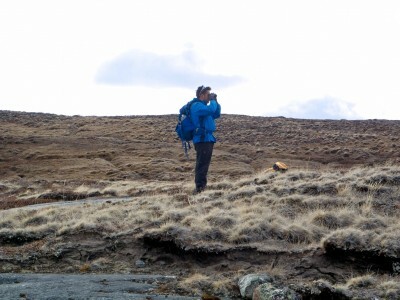 In this photo, he is looking at muskox in the area, making sure to steer clear of these large animals. Nathan Amador Rowley is originally from Southern California. He attended Ohio State for his bachelor’s and master’s degrees and earned his Ph.D. from Penn State in 2015. His doctoral research explored the climatic influences and controls on the abundance and distribution of supraglacial melt lakes in Western Greenland. Nathan Amador Rowley’s research consists of mapping environmental degradation through deforestation of tropical forests to plant African palm. 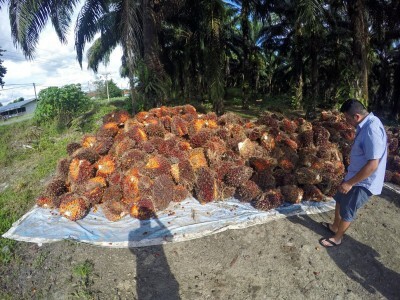 The fruit produces palm oil, which is a large global commodity.